For indoor versions of association football, see futsal, indoor soccer, and five-a-side football. For other uses, see Indoor football (disambiguation). In the United States, indoor football is football played at ice hockey-sized indoor arenas (as opposed to certain NFL teams which have large indoor stadiums, such as the New Orleans Saints who play in the Mercedes-Benz Superdome). While varied, the rules of indoor football are designed to allow for play in a smaller arena. The indoor football season typically begins in mid- to late-winter and ends by mid-summer. San Jose SaberCats and Columbus Destroyers in ArenaBowl XXI, the 2007 championship game of the Arena Football League. The first documented indoor football games were those played at Madison Square Garden in 1902 and 1903, known as the "World Series of Pro Football." The games were played on a 70-yard by 35-yard dirt field but otherwise adhered to outdoor rules. Poor attendance led to the tournament being discontinued after two years. In 1930, the Atlantic City Convention Center constructed a full-size indoor football field, and used it for one to three games a year during the 1930s; the stadium stopped hosting games in 1940 and did not resume hosting football games until 1961. In the 1960s the Boardwalk Bowl, a post-season game involving small college teams, was contested at the convention center. The Bowl was an attempt to make Atlantic City more of a year-round resort in the pre-gambling era as opposed to a single-season one (the Miss America Pageant, also held at the center, likewise began as an attempt to extend the season beyond Labor Day). The Atlantic Coast Football League played its inaugural championship game at the convention center in 1962, but the game only drew 2,000 fans and the game would thereafter move to the home stadium of the team with the best regular season record. The Philadelphia-based Liberty Bowl game, which had been played at Municipal Stadium from 1959–1963, was moved into the Convention Center in 1964 for the contest between Utah and West Virginia. The game drew just over 6,000 fans, though, and the Liberty Bowl moved to Memphis the next year, where it is still held as of 2015. Unlike modern indoor football, the size of the playing surface and hence the rules were essentially the same as in the standard outdoor game, with rules updated to deal with contingencies for what could happen indoors, such as a punt striking the ceiling. The end zones were slightly shorter—eight yards instead of the standard ten. 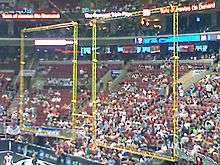 An arena football goalpost. Notice the rebound nets on either side of the uprights. While several attempts to create a true indoor football game have been made since shortly after American football was developed, the first version to meet with relatively widespread success and acceptance is Arena football, devised by Jim Foster, a former executive of the United States Football League and the National Football League. He devised his game while watching indoor soccer, another game derived from a sport played outdoors. He worked on the game in the early 1980s, but put any plans for full development of it on hold while the United States Football League, an attempt to play traditional American football in a non-traditional (spring-summer) season, was in operation in 1983–1985. When the USFL ceased operations, Foster saw his opportunity. He staged a "test" game in Rockford, Illinois in 1986 and put together a four-team league for a "demonstration season" in the spring of 1987, with games televised on ESPN. Foster had to adopt a field that would fit within the smaller playing surfaces found in most arenas and thus created a field that was identical in size to a standard professional ice hockey rink, 200 by 85 feet (61 m × 26 m). This resulted in the field being 50 yards long (half of the length of a standard American football field) with eight-yard end zones (which may, if necessary, be curved in the end zones as hockey rinks are), and the field being slightly over half as wide as a standard football field. Although it was not as much of an issue then as it is now, Foster adopted artificial turf (such as AstroTurf) for the field, because of its ability to be rolled up when the arena is being used for other sports. Foster adopted a modified version of eight-man football. He also mandated a one-platoon system that required at least six players "go both ways", playing on both offensive and defensive downs. This had the added desirable effect of limiting team payrolls. the banning of punting, meaning that if a team felt it was not likely to get a first down after three plays its only kicking option was to attempt a field goal. the placing of rebound nets around the ends of the playing surface; kicked and passed balls bounced off these nets and remained in play. In the case of a pass, the ball is live only until it touches the ground, but in the case of an unsuccessful field goal or a kickoff, the ball remains in play unless it goes out of bounds or until the player recovering it is downed by contact or scores. This means that on every kicking play except an extra point attempt, either team may have a shot to regain the ball and advance it, much as a blocked kick could be in the traditional outdoor game. Only kicked or passed balls touching the slack nets behind the goalposts are ruled dead at that point. To further an offensive passing advantage over the defense, Foster also imposed strict restrictions on the defensive formation, mandating that all defenses played a 3-2-Monster formation (three defensive linemen, two linebackers, two cornerbacks, and one safety). Linebackers were not permitted to blitz and were required to stay in boxes behind the line of scrimmage, while defensive linemen where hindered by restrictions that prevented them from using certain techniques to penetrate the offensive line. Quarterbacks and placekickers were exempt from the one-platoon system, allowing two key scoring positions to be more specialized. The AFL also adopted the USFL's concept of playing in the late spring and summer, since this is when most hockey and basketball arenas have the fewest schedule conflicts (only competing with touring stadium rock concerts). The spring schedule has since been imitated by virtually all other professional indoor leagues as of 2010. Within a year of the AFL kicking off, its first challenger, the World Indoor Football League formed. The WIFL planned to play a schedule with six teams beginning in summer of 1988 with its own set of indoor-inspired rules, including an unusual system that would have eight men on offense and seven men on defense. Despite having backing from former NFL players, veteran coaches, and singer John Mellencamp, the league canceled its 1988 season, folded half of its franchises (including Mellencamp's), and made an unsuccessful bid for the remaining three teams to join the AFL. In 1990, Foster patented the rules of Arena football, meaning that only persons authorized by him could use his rules and his name for the sport. While the AFL asserted throughout the 1990s that the patent covered virtually every aspect of the game (from the 50-yard field to the eight-man format), a 1998 lawsuit (Arena Football League v. Professional Indoor Football League) established that the patent specifically covered the rebound net feature, meaning that competitors and imitators who attempted to copy the game couldn't use this aspect of the rules. However, under provisions of U.S. patent law, Foster's patent expired on March 27, 2007, enabling imitators to use his rebound nets (at least as originally envisioned, without other innovations that he may have patented). The most remarkable development in Arena football, other than the AFL signing a major network television broadcasting contract with NBC, was the development of the official Arena minor league, af2, beginning in 2000. This effort basically served two purposes: one as a developmental league for Arena and as a place where former collegiate players could develop while at the same time learning and becoming accustomed to the unique Arena rules, and secondly as a pre-emptive way of shutting out potential new indoor football competitors (this was especially important as the 2007 expiration of Foster's patent on the rebound nets approached). At times over forty teams participated in this league, almost uniformly in cities which also had minor league ice hockey teams and hence suitable arenas. Shortly before the end of 2008, the Arena Football League announced that it would not be playing a 2009 spring season but that the play of its developmental league (af2) would continue as scheduled. During the previous few years, the league administrators and team owners had allowed player salaries and other costs to rise to the point where the league and many of the teams were losing a substantial amount of money. Late in the summer of 2009, with the team owners unable to agree on a plan for making the league viable again the AFL announced that it was folding. The Arena Football 2 League played a successful 2009 season. Most of the teams made a sustainable profit and the team owners were eager to see the af2 continue for another year. However, as it became apparent that the AFL owners would not be able to adopt a workable business model, the af2 team owners found themselves facing a problem. With the AFL owning 50.1% of the af2, it would fold if the AFL folded. At the end of the 2009 season, a gathering of af2 and AFL team owners set out to form their own organization, originally known as Arena Football 1. AF1 went on to purchase all assets of the original AFL and af2, except for a few team names and logos owned by outside parties, in a December 2009 bankruptcy auction. Shortly after the purchase, AF1 adopted the Arena Football League name, and the reborn AFL began operations in 2010. The "iron man" rule, requiring at least six of the eight players to play on both offense and defense, was dropped, but most other past AFL rules remained unchanged. The league subsequently re-entered former AFL markets (some of which it has subsequently left again) and its teams took up the names of their markets' former teams; the Bossier City Battle Wings became the revived New Orleans VooDoo, the Alabama Vipers assumed the identity and history of the Georgia Force, the expansion Milwaukee Iron assumed the name and history of the Milwaukee Mustangs and the Philadelphia Soul franchise was revived for the 2011 Arena Football League season as well. All but the Soul are now defunct teams. By the end of the 2016 season, a series of contractions and defections led to the loss of the majority of the AFL's franchises. The league was left with three established teams and two, the Washington Valor and an unnamed team in Baltimore, that were both held by the same owner and had yet to begin play. The loss of that many teams raised doubts about a 2017 season; the league nonetheless intends on continuing in the long term. 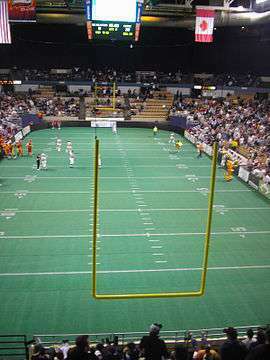 An example of an indoor football field, lacking rebound nets. As the AFL and af2 were having to deal with the fact that the AFL had overextended itself, two newer leagues were solidifying their positions in the world of Indoor football. It should be noted that the brand of indoor football they are playing does not use the rebound nets and is more of a defense based game than Arena football. On October 19, 1998 Richard F. Suess (of the original Professional Indoor Football League) filed for and was subsequently awarded U.S. patent number 6,045,466 for his version of Indoor Football; Suess's proprietary version, which included rebound nets in the middle of the field instead of the ends, has never been played, and Suess never used rebound nets in the original PIFL. The Indoor Football League entered 2011 as the largest (in number of teams) of the currently- existing indoor leagues with 22. It began in the autumn of 2008 when two already-established leagues (Intense Football League and United Indoor Football) chose to merge into a single organization. The IFL's expansion model has been based less on establishing brand-new teams and more on acquiring existing teams from other leagues. Teams have left the Continental Indoor Football League and the Southern Indoor Football League to join the IFL. At least four franchises of the now-defunct af2 chose to join the IFL instead of aligning with the revived AFL. Since then, the league has lost teams to the Lone Star Football League, Professional Indoor Football League, the Champions Professional Indoor Football League, and the Continental Indoor Football League. The league is now down to nine teams. The most recent incarnation of the Southern Indoor Football League was the result of a merger of a smaller league of the same name, which was founded in 2009, and a portion of the American Indoor Football Association. The league is the second reorganization of what originally began as the Atlantic Indoor Football League in 2005. The AIFL was dissolved after the AIFA absorbed the remaining teams after a tumultuous 2006 season; the AIFA merged with the original SIFL in fall 2010 after the league's western teams split off to form their own league (which ceased operations before beginning play). The SIFL, including its predecessors, played its seventh season in 2011 as a near-national league stretching from Pennsylvania to Texas before breaking up into three regional leagues prior to 2012: the revived AIFA, which changed its name to American Indoor Football and dissolved in 2016; the Lone Star Football League (which later merged into Champions Indoor Football); and the Professional Indoor Football League (which dissolved in 2015). Several other indoor leagues have been announced without ever actually commencing play, or operating only briefly with a handful of teams. Like the Arena Football League, all of these operations contemplated their playing season as being entirely or primarily outside the traditional fall/early winter season of the older sport so as not to be competing with it directly for fan support. Some were apparently attempts to form a second "major" league of indoor football while others were strictly efforts to form a new "minor" league. The common factor all seemed to share was serious undercapitalization. Since the first non-Arena indoor league (Professional Indoor Football League) began in the late 1990s, there has often been a pattern of instability. Each off-season has seen teams jumping from league to league. In addition, leagues have annually merged, changed names, and separated. The organization that was most recently AIF went through three names and two ownership changes in its first three seasons. A few leagues have achieved a certain level of stability, though still many teams go from one league to another annually, both between each other and between regional and national leagues. Currently, the Indoor Football League and Champions Indoor Football, both of which are concentrated in the central United States, and the Major Indoor Football League, a semi-pro/amateur outfit in the mid-Atlantic that evolved from a six-man football league several years ago, are the only established regional leagues that plan to play in 2017. In the northeastern U.S., the Can-Am Indoor Football League is aiming to launch in 2017, while the Southeastern U.S. is facing a turf war between five new leagues, each backed mainly by individual teams: the Columbus Lions are backing the National Arena League, the Cape Fear Heroes are attempting to launch Supreme Indoor Football, the Savannah Steam seeks to establish Elite Indoor Football (which later made cross league schedule with the SIF), a Myrtle Beach-based league called Arena Pro Football that also includes teams in its schedule that are in other new leagues, and United States Indoor Football which was founded by another outfit in Savannah called the Coastal Outlaws and all games played in Savannah. Many leagues have also been plagued with internal dissension. For example, the NIFL was characterized by annual issues between teams and league owner Carolyn Shiver before it folded after its 2007 season, while the APFL ended its 2006 season with a forfeit of the championship game when the league offices refused to allow the championship game to be hosted at the home of the team who had won the right to host and refused to play the game, and the CIFL had its defending champion Rochester Raiders quit the league in the middle of the playoffs in 2008. At the end of the 2009 season, the league champion Chicago Slaughter left the CIFL to join the IFL. They were joined in this move by the Austin Turfcats who had left the SIFL. The Slaughter returned to the CIFL after the 2013 season. The best-known indoor women's football league is the Legends Football League (formerly known as the Lingerie Football League). Known for its scantily-clad players and its signature event, the Legends Cup (formerly Lingerie Bowl), the LFL plays by a variant of indoor rules and played most of its games in indoor stadiums. The league's brief foray into Australia was played in outdoor stadium; these teams nevertheless played under indoor football rules, and they and a few LFL-US teams that are either defunct or now play indoors are the only teams known to have played the indoor game outdoors. Otherwise, all other women's leagues play on outdoor fields with outdoor rules; there have been attempts to form indoor women's football leagues, but none have made it to play. The Continental Indoor Football League, a traditionally men's league, earned a certain notoriety by being the first professional men's football league (indoor or outdoor) to employ female placekickers: Katie Hnida with the Fort Wayne FireHawks, and Julie Harshbarger with the league's oft-renamed Chicago franchise. All current indoor football teams play at a minor league or even semi-professional level. The average player's salary in the Arena Football League was US$1,800 per game in 2008; this is about a one quarter of the Canadian Football League and the XFL (adjusted for inflation) and half the salary the United Football League was paying at the end of its lifespan in 2012. af2 paid its player $250 per game and the AIFA and IFL had per-game salaries of $200 per game; the current AFL pays $885 per game for most players, with that number expected to jump to $940 per game in 2013 (although players will have to pay their own housing, which the league currently provide); starting quarterbacks receive a $300 per game bonus. As of 2012, the IFL pays $225 per game, with a $25 bonus for each win. Running back Fred Jackson rushed for over 1,000 yards as the starting running back for the 2009 Buffalo Bills, and his high quality play earned him a spot on USA Today's "All-Joe" Team. Jackson played the early part of his professional football career for the Sioux City Bandits now of Champions Indoor Football. Probably the most notable player to come out of Arena football into the National Football League is Kurt Warner, former MVP quarterback of the Super Bowl XXXIV champion (2000 game, 1999 season) St. Louis Rams, who had previously quarterbacked the former Iowa Barnstormers of the AFL. The National Football League removed a ban that had been in place on any of its owners owning teams in any other sort of football operation with respect to Arena football only, and several of them had bought or started Arena teams at one point. However, the NFL allowed to lapse an option it had negotiated allowing it to purchase up to 49% of Arena football, and as of early 2007 seemed to have backed away from any plan it may have had to use Arena football as a developmental league in any sort of "official" sense, perhaps in the interest of not undermining its then-existing "official" developmental league, NFL Europa. Several NFL owners owned Arena Football League teams in their own cities prior to the league's bankruptcy. At the end of the 2008 season, Jerry Jones and the Dallas Desperados (who had similar colors and logos to the Dallas Cowboys), Arthur Blank's Georgia Force, and the Colorado Crush (whose shareholders included Broncos owner Pat Bowlen and Rams then-minority owner Stan Kroenke) were still in the league. San Francisco 49ers owner Denise DeBartolo York and Washington Redskins owner Daniel Snyder had future expansion rights to their respective cities. Tom Benson's original New Orleans VooDoo and Bud Adams's Nashville Kats had already folded prior to the bankruptcy and none of the NFL owners with AFL franchises returned to the league after its reformation in 2010, and most favored abolishing the league entirely. Several former and current professional outdoor football players also have been owners of indoor football franchises. Derrick Brooks – Tampa Bay Storm. ↑ DiPaola, Jerry (June 19, 2012). "AFL players score hefty raise in new CBA". Trib Total Media. Retrieved 2014-03-18. ↑ "Terrell Owens scores three touchdowns. Indoor Football League". Yahoo! Sports. Yahoo!. Retrieved September 24, 2012. ↑ Hahn, John (2009-08-11). Who Really Killed the AFL?. OurSportsCentral. ↑ Kyle Austin (November 11, 2011). "Local ownership group, including Stuart Schweigert, purchase Saginaw Sting indoor football team". Retrieved December 13, 2011. ↑ Jason Bristol (March 14, 2012). Marques Colston becomes part-owner of Harrisburg Stampede "Marques Colston becomes part-owern of Harrisburg Stampede" Check |url= value (help). ↑ "Oswego Resident and Former Chicago Bear Joins Kane County Indoor Football Team Staff". www.montgomery.patch.com. Patch Network. November 5, 2012. Retrieved November 9, 2012. ↑ Rick Stroud (April 12, 2011). "Derrick Brooks to become Tampa Bay Storm president, part owner". Tampa Bay Times. Retrieved November 15, 2012.